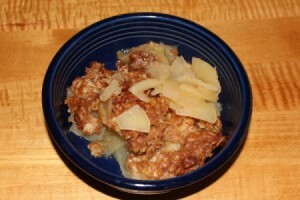 Honeycrisp apples are great apple to use for crowd pleasing dessert recipes like an apple crisp. This is a guide about honeycrisp apple crisp. Honeycrisp apples are my favorite. Every year I can't wait for them to show up at the local farmer's market, so I can make my favorite apple crisp. I think Honeycrisp apples have the perfect texture and combination of tart/sweet flavor to make crisp. They cook up really well, and I can usually get them by the box at the market for about $1.50/lb. which is much less expensive than the store. Place apple slices in 9x9 inch pan. Sprinkle sugar over top. Mix oatmeal, brown sugar, flour, nutmeg, and cinnamon in a separate bowl. Cut in butter until mixture resembles coarse crumbs. Sprinkle over apples. Bake at 375 degrees F for 40 minutes or until topping is golden and fruit is soft. Serve warm. I enjoy apple crisp by itself, but it also tastes great with ice cream or vanilla yogurt. I think it would be hard to fit 10 cups of apples in a 9X9 inch pan.